Every so often, a car comes along that blows your mind. Slightly less often, that car has an amazing story behind it. The last Duesenberg SJ is one of those cars, and this is one of those stories. This is Flashback Friday, a weekly feature where we republish classic stories from the Jalopnik archives. Think of it as Jalopnik's 'Best Of' series. We chose this story because there are few things as cool as a '30s road rocket, and because the Auburn Cord Duesenberg Museum in Auburn, Indiana, warped our brains at a young age. —Ed. One can barely wrap the mind around the concept of the last of any marque. Is there somewhere squirreled away the final DeSoto, the final Austin? Did anyone care to keep them around in carefully managed condition, warding off the meddling hands of restorers — and if they did, does the story of the final car cast a shadow of awesome grandeur fit to honor its maker's history? There are many automobiles that represent the final stroke of the transfer presses, the last report of an impact hammer, the final time the lights were turned out over an ordered assembly floor. 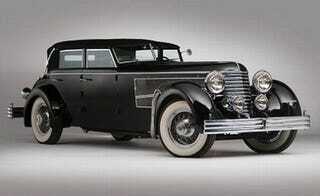 But we doubt any of them have a story to match 1937 Duesenberg Model SJ number 397 — the last Duesenberg. Fate is a funny thing. It often has a sense of humor, and it can twist a storyline to the point of unbelievability. Such is the tale of SJ-397. Both Rudolf Bauer and the Duesenberg brothers were likely not aware of each other as they rose from obscurity to the heights of wealth and privilege, then saw it all slip away through forces outside their control. Duesenberg began as most early automakers did — as a racing habit that turned into a car-building business. German-born American brothers Fred and August Duesenberg incorporated the Duesenberg Automobile & Motors Company in 1913 and proceeded to build some of the most advanced vehicles of the time. Their cars were well known as Indianapolis 500 race winners, and they were the first American machines to win at Le Mans. After success in racing, the brothers set out to take on the mass market with their Model A. And it was that choice that began a series of events ultimately leading to ruin. The Model A was a terrible failure, selling only 667 copies. By 1922, Duesenberg was bankrupt. Rudolf Bauer was perhaps one of the most influential abstract artists of the prewar German landscape. Something of a savant, he began painting at an early age and won a place in the emerging German avant-garde scene. It was in this movement where he met Baroness Hilla Rebay von Ehrenweisen, the daughter of a Prussian Army aristocrat. Their tumultuous relationship would end when Rebay left to act as art director for Solomon Guggenheim (yes that Guggenheim). Bauer was brooding and arrogant, and he painted in an unreflective, empirical style — a style that, with Rebay's prodding, caught the eye and patronage of Guggenheim. Selling every piece he could complete now that he had an attentive audience, Bauer's fame grew with European and American collectors, as did his wealth. He spent extravagantly on everything from his home to his cars. As the curtain of Nazism descended across Germany, Rudolf, oblivious to the growing danger, decided to commission his greatest work. The Duesenberg name did not immediately fade away. Fred Duesenberg, along with a consortium of investors, rescued the company from its creditors. He then brokered a deal in 1925 with Erritt Cord, who purchased Duesenberg in hopes of using its engineering prowess to form a premium brand under the Auburn Automobile name. The following year, the Duesenberg brand introduced the Model J at the New York Auto Show. A chassis of leviathan proportions, it was a technological tour de force: With a nearly twelve-foot wheel base and weighing a ton and half, the frame cradled a 420-cubic-inch straight eight with aluminum pistons and connecting rods, four valves per cylinder, and dual overhead camshafts riding in a detachable cylinder head. In standard form, the engine was capable of 265 hp — so powerful that the originally planned four-speed gearbox was replaced with an unsynchronized, and stronger, three-speed. The chassis was equipped with a system that automatically lubricated all service points using engine oil pressure. In 1932, a centrifugal supercharger, stronger valve springs, and tubular steel connecting rods were added, boosting power to an intoxicating 320 hp — nearly triple the output of the car's closest competitor, the 115-hp Pierce Arrow. The new chassis was dubbed the Model SJ, and chief among its talents was a breathtaking top speed of a claimed 135 mph. But the times, they were a-changin'. The Great Depression was souring coffers across the country, international competition was intense, and Duesenberg's development money was more urgently needed in the Auburn and Cord divisions. The Duesenberg Motors Company withered on the vine. In addition to funding shortages, Duesenberg suffered a terrible loss when co-founder Fred died in an automobile accident. His engineering capabilities were necessary to replace the SJ's unsynchronized three speed transmission; in its current form, the car was difficult to drive compared to the competition. As Errett Cord's empire collapsed under the weight of economic pressure, there was no choice but to shut down the Indianapolis production line in 1937 — but not before one final sale. Rudolf Bauer arrived in America in 1937 with the hope of securing a copy of the finest automobile chassis in the world. With the assistance of German coachbuilder Erdmann & Rossi, he drew up plans for the longest automobile to ever grace German roadways. As Rudolf arrived in Auburn, Indiana to place his order, the Indianapolis plant was beginning its shut-down process. In spite of this, under the watchful eye of August, workers gathered the remaining parts to assemble one final car: SJ-397. Word of Bauer's transaction, as well as his purchases of US currency, soon made their way back to Germany. Upon his return home, Bauer was arrested by the Nazis as a pro-western sympathizer and thrown into prison. When news of his imprisonment made its way across the Atlantic, the Duesy's shipment to Germany was put on hold. In New York, work to free Bauer was already beginning. Rebay petitioned Guggenheim to bring his resources to bear, and in 1939, the two men were able to secure Bauer's release. Here the plot thickens. Upon his return to the United States, Rebay persuaded Bauer to sign into an agreement that would pay back the cash exchanged for his release. He would receive a mansion on the New Jersey shore, and — hold the phone — endow the Guggenheim foundation with the interest from his trust fund. In addition, all of his future works would go directly to the Guggenheim. Bauer was furious when he found out what had happened (he spoke little English and made the cardinal mistake of trusting a former lover as a translator). With that in mind, he gave a big 'eff you' to the contractual scoundrels and never painted again. But he did continue to build his car. Rudolf contracted the services of Rollson and Creteur, the finest design and fabrication house in the United States at the time. He delivered to them three detailed concept sketches and a list of requirements. In the spring of 1940, he took delivery of his Duesenberg. Bucking trends of the era, Bauer's design emphasizes, rather than downplays, the chassis's massive heft. There are no pontoon fenders leading to running boards; indeed, the car features cycle fenders no running boards whatsoever. Two white-wall spares rest in the back, bringing the total length to 20 feet, six inches. To this day, the car wears an unretouched and original coat of black paint, with a quirky purple interior that seems somehow appropriate. Wartime fuel-ration stickers still reside on the window, and the original luggage still lives in the trunk. The SJ has a mere 9884 original miles on its very capable mechanicals — it practically still has that new-car smell. Every automaker is a distillation of the driving force of men with a will to power. Whether the endeavor began in a garage or a boardroom, visionaries always emerge to push toward perfection. Duesenberg Model SJ number 397 embodies the passion of so many visionaries that is nearly transcends the art of the automobile. It stands as a testament to what can be done when the forces of brilliance and vengeance converge — a $2.8-million Nietzschean metaphor. This story originally appeared on Jalopnik on April 1, 2008 at 12:30 PM EST.